Want to know how to get Gmail read receipt on your inbox? Yes you can get it easily with the RightInox Addon. 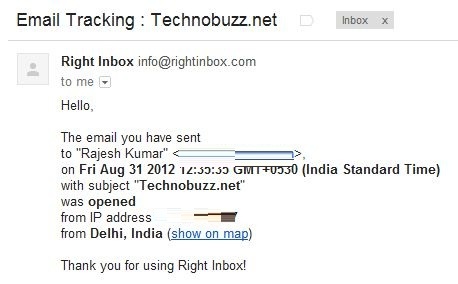 RightInbox is extension for Gmail which helps you to track sent emails and get notified when it is opened. It’s a free extension available for both Google Chrome and Firefox browser. With this addon you can easily track you Gmail mail and always get a notification on your inbox that email is opened by that person or client. One of the best and easy to get read receipt notification on Gmail inbox, this addon will let you know when and where the recipients open the emails that you have sent them.So leta take a look how the addon works on Gmail Inbox. 1. Go tot he RightIbnox home page and install the extension on your browser. 2. After the extension installed on your browser, login to your Gmail account. A notification will appear, click ‘Continue’ and then follow the instruction to allow it to access your Gmail. 3. Compose a new message in Gmail. Here you will see a new button with a check box next to the title of Track. Compose you mail and hit the track button to track your mail and get read receipt on your Gmail inbox and send it on its way. 4. 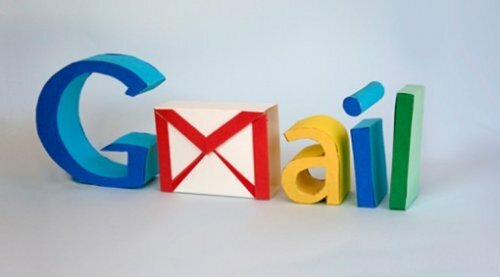 Once the recipient opens the e-mail you will get the notification on your Gmail Inbox that the e-mail has been opened with details, that includes the IP and location. You can check out this demo video. That’s all, you can now track your emails on Gmail, Also it gives you the option to schedule you email to sent them later. Tracking will help to let you know if the e-mail has been opened. What do you guys think about this addon. We will love to hear your feedback regarding the addon. Looking for more Gmail Tips, Click here!